Fresh orange paint, and he's ready to go! As today is the dreaded Tax Day, here's a 'sunny thought' to help make everything better. This morning Disney finally returned the Orange Bird to Walt Disney World, and I'm very happy about that! Hooray, I love the little Orange Bird! He's so cute -- and he's so orange! 1970s snapshots of the original figure sculpt, WED Imagineering, Glendale. Folks enjoying their frozen Citrus Swirls at the newly renovated Sunshine Tree Terrace in Adventureland can once again see the original Orange Bird figure above the counter, this time not in a tree but perched on a fruit crate. 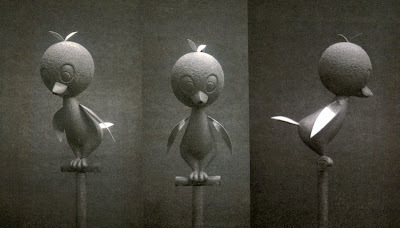 The figure was long thought to be lost but I was able to provide a tiny bit of assistance to the Disney Archives in their identifying the figure through some photos I had kept in my files. Apparently the Orange Bird had been taking a decades-long nap in a drawer at Imagineering right under everyone's noses. from a color slide taken in 1980 by Stacia Martin. Thanks to our friends at WDI and the W.D. Archives, for restoring a wonderful bit of nostalgia for a new generation! well done! he looks fantastic!! A very exciting day. He looks great! Didn't he also used to 'think' projected thoughts? Ducky, yes he did. I had heard that as of a couple of years ago, the projector for the 'puffs of orange smoke" that appeared above his head was still bolted into the ceiling above the service counter. I would imagine it's gone now, but it would be great if WDI would rig him up to 'think' again. I've read so much about vintage WDW, and wish I could have seen it in the early days; it makes me happy to know that a wonderful element like the Florida Orange Bird has returned. ORANGE you glad as I am he's returned to "The Vacation Kingdom"!!!?? Has the music returned today as well?? So happy to see the Orange Bird back in Adventureland where he belongs. Little details like this are what make all the Disney parks special. It's details like this that have been sorely lacking at WDW last 10 years or so. 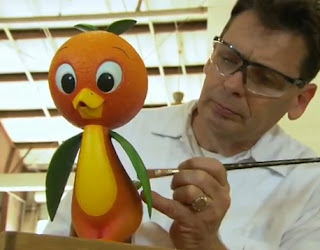 Kevin - can you and Jody campaign WDW to let you guys make an Orange Bird sculpture? You guys Rock out the BEST retro merchandise! not the same bird. 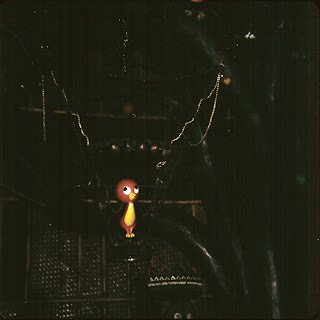 the bird in the tree was an animatronic. the one that was "found" is a sculpture and i have yet to find out what the history is behind the sculpture.